To cube or not to cube? That question isn't hard to answer when Miracle Cubes and Super Miracle Cubes are on sale! Ready to enlist the help of powerful monsters in MapleStory in battle? Booster Packs and Legendary Booster Packs of Monster Familiars are here to back you up! The wily Fennec Fox and other delightful packages are also still here, along with many other promotions. Read on and check out what's in store. The good old Miracle Cube is on sale for just one week! Reset revealed potentials in pursuit of the godliest weapon ever. As a bonus, each time you use a Miracle Cube you will receive a Miracle Cube Fragment in the Use tab of your item inventory. After you collect five of these, double-click them to obtain a Potential Scroll, or combine ten to earn an Advanced Potential Scroll. This item will expire in 3 days after purchase if not used, so be sure to take it out of the Cash Inventory and use it up! A potential is a hidden attribute contained within certain special "unidentified" weapons. You need Magnifying Glasses, which can be purchased from store NPCs, to identify the potential on those items. Potential items also have ranks: Rare, Unique, and Legendary, with Legendary being the most powerful. Higher ranked items will have better potential powers. You can only get items with hidden potential on them as drops from monsters or if you transform them yourself using a Potential Scroll or Tim's Secret Lab. If items with potential are fused, the resulting item will also contain potential. How does the Miracle Cube fit into the Potential system? 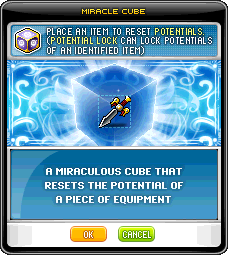 Miracle Cubes are used to reset revealed potential stats on Rare and Unique equipment items, so if you're not happy with an item's potential, you can use a Miracle Cube to hide it, then use another Magnifying Glass to unlock a new potential. Get the step by step instructions right here! It's a bird It's a plane It's the Super Miracle Cube Sale! Use a Super Miracle Cube to reset your item's potential, and it just might transform from Unique to Legendary in the process! 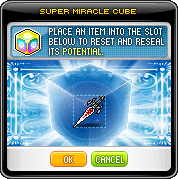 As a bonus, each time you use a Super Miracle Cube you will receive a Super Miracle Cube Fragment in the Use tab of your item inventory. Combine twenty of these to obtain an Advanced Equip Enhancement Scroll, or combine thirty to earn an Epic Potential Scroll 80\%, which can raise items from the Rare potential tier to the Epic tier. This item will expire in 3 days after purchase if not used, so be sure to take it out of the Cash Inventory and use it up! How does the Super Miracle Cube fit into the Potential system? Like regular Miracle Cubes, Super Miracle Cubes reset the potential stats on items with revealed potentials, but they also have a greater chance to raise an item's potential tier! Also, only Super Miracle Cubes have a chance to raise Unique potential tier equipment to the highest Potential tier: Legendary. Once your items reach the Legendary Potential tier, only Super Miracle Cubes can be used on them to reset their stats. Monster Familiars, the cute but vicious monsters around your level that fight alongside you, are available for a discounted price for two weeks! Are you still at the beginning of your training and in search of a perfect ally in combat? Then the Booster Pack is perfect for you! Booster Packs give out three random Familiars: two common and one uncommon or better.